The event is set to start at the times below -- so get ready! 11:26AM Looks like that's it! Lots of questions still linger, if you ask us. 11:26AM "Okay so I think this is it. Has that helped? I wish we could have done it sooner, but then you wouldn't have had anything to write about." 11:25AM Q: Will the bumper offer extend outside of the US? Q: And beyond September 30th? 11:24AM Q: You've been communicating with customers through email quite a bit -- how is that impacting how you're dealing with these issues. 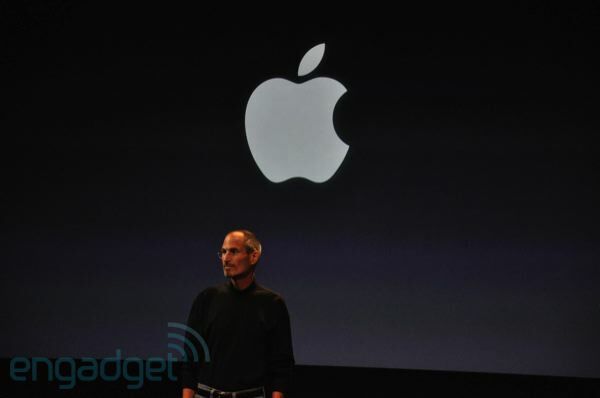 Steve: I always have, and you know, the address is out there and I've always emailed people back. I try to reply to some of them because they're our customers. But now people post them to the web... and some people just make things up. So don't believe everything you read! A: They're probably unrelated. I honestly don't remember what the issue was before, but they're probably totally separate. 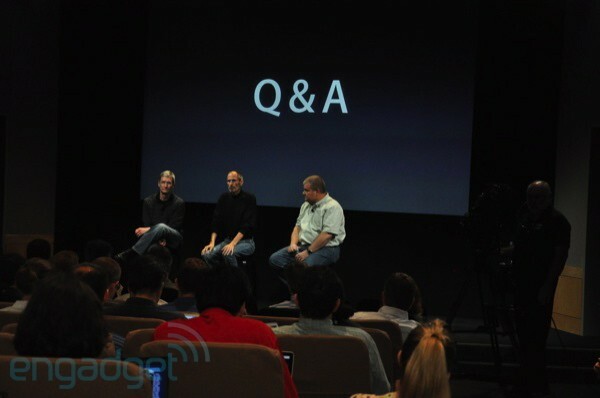 11:22AM Q: You released a software update for the iPhone about two years ago which improved the signal. You say now you've got a long-standing bug that doesn't show the right bar data. Can you square those two things? 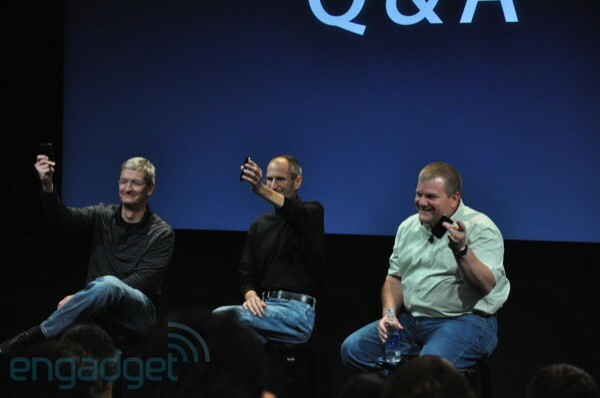 Steve: Well let me say something about Apple. We didn't want to get into any business where we didn't own or control the primary tech, because if you don't the people who do own it will beat you. 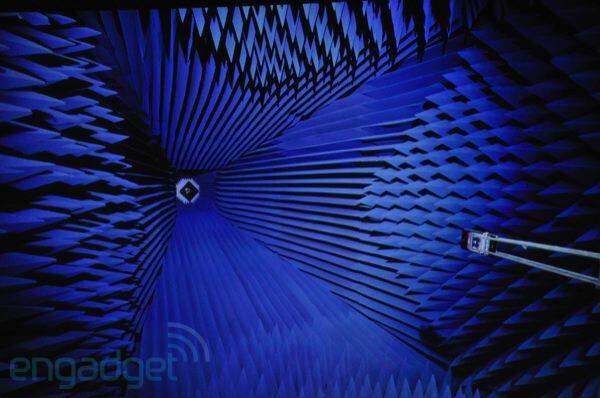 Our big insight about 8 years ago, was that it was going to shift from big displays or optical pickup heads, or radios being the most important component, we thought it was going to be software. And we're pretty good at making software, we showed that in the iPod... other people are good at it too, like Palm, but we brought great software to the smartphone space. We've been able to create and distribute major updates to this software since the iPhone was released, and we've made the product better and better for free. Everyone is copying us now, but we were the first ones to do it. To answer your question, the formula we use the calculate bars has been off since the beginning, and the new update fixes that for the iPhone 4, 3G, and 3GS... I don't know if I understand the other part of your question? 11:17AM Q: Quick followup question to Scott's point, about the stack on the cellphone. I'd like to know if the handset has any role in congestion management... the congestion problem, it didn't get better with the iPhone 4. Does the stack play no role at all in the management of congestion? Steve: I'd let Scott take this in a second, but first, when AT&T wants to add a cell tower in Texas, it takes about three weeks... when they want to add one in SF, it takes three years. That's the single biggest problem they're having. They're spending a lot expanding their networks, and our data rates are way better on the iPhone 4, but AT&T has to expand its network, and that's a long process. I know because we're constantly asking about it. They're trying really hard, and sometimes I think they should enlist the support of the users in the community. 11:15AM Q: What kind of impact do you think this will have on sales? Tim: We'll hold financial stuff for our Q2 results call next week. 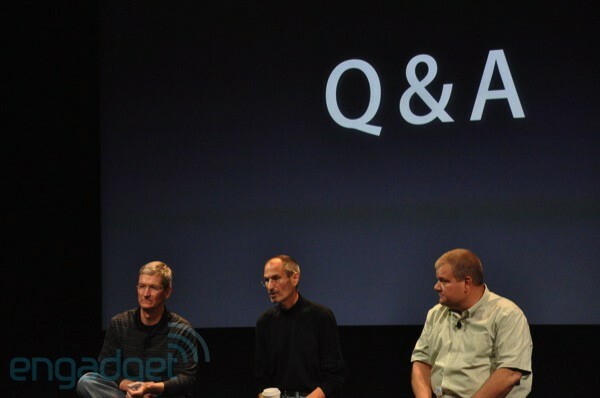 11:13AM To be clear, Jobs was not happy with our question. "You guys talk to each other a lot." 11:12AM We asked if there was possibility of a software fix... based on the NYT article stating an inside source claimed there could be a fix of that type coming. 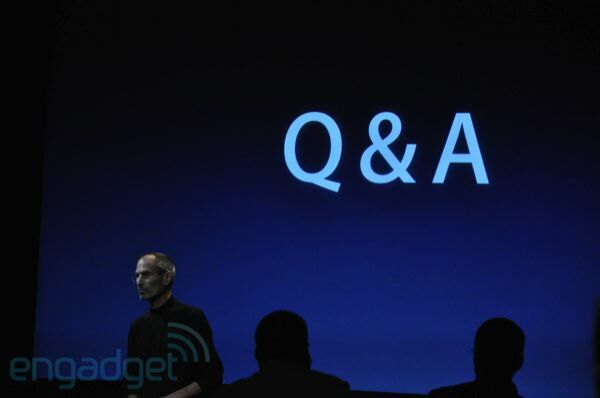 Steve had a long answer largely dismissing the question. 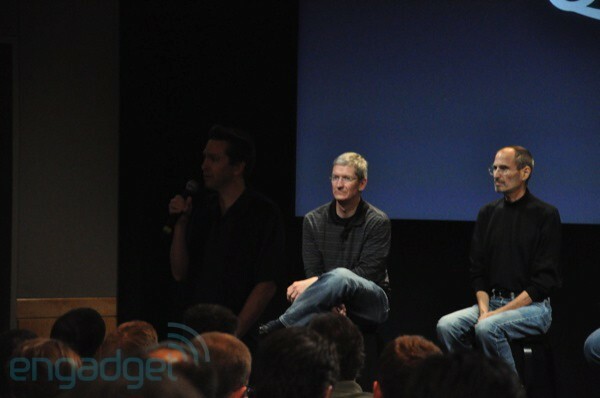 Then Scott Forstall asked for a mic, and he said that the statement in the Times was "patently false." 11:08AM Q: Was a recall ever up for discussion? Bob: For the record, we told them we were coming first. Steve: And we didn't break down any doors. Big laughs for that one, on stage at least! 11:06AM Steve: But not everyone is seeing this -- a small number encounter it. 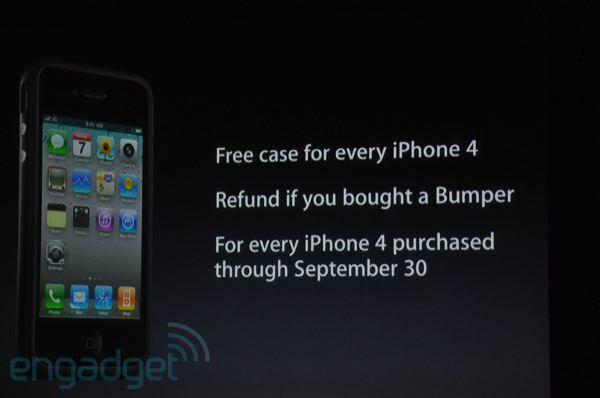 For those customers we'll get them a case, and if that doesn't work, we'll get them a full refund. And we'll continue to work on antennas that don't have this problem. But I think we're where the rest of industry is right now. 11:04AM Q: Is there a hardware redesign in this generation that could fix this problem? A: You can go on the web and look at pictures of Nokia phones that ship with stickers on the back that say "don't touch here" -- you can go on YouTube and see these. We should you three phones today, all good phones. So right now the state of the art of the entire industry is that no one has solved this problem. 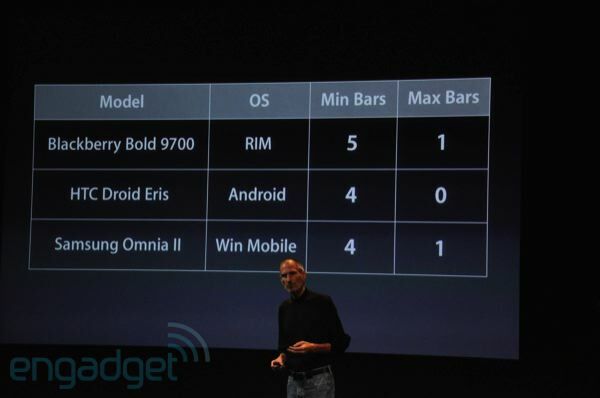 Would I like Apple to be first? Yes. Can we make it better right now? Maybe, we'll see. 11:03AM Q: Would you have done anything differently knowing what you know now? 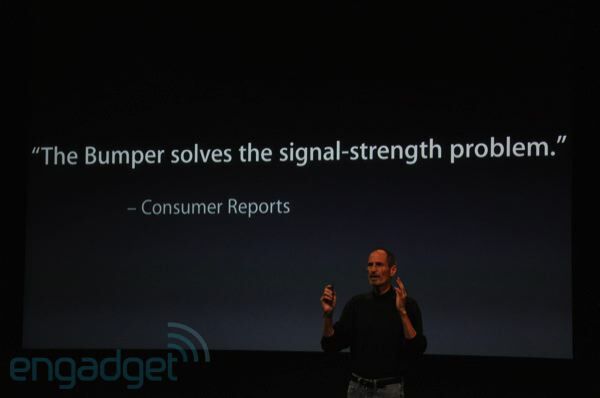 Steve: Well, of course the Consumer Reports stuff was bad, and of course we would have liked to get on this sooner. We just got this data. We just learned what was going on. We're an engineering company. We think like engineers. We love it, we think it's the right way to solve real problems. I don't think that's going to change, and the way we love our customers isn't going to change. Maybe it's human nature -- when you're doing well, people want to tear you down. I see it happening with Google, people trying to tear them down. And I don't understand it... what would you prefer? That we were a korean company, that we were here in America leading the world with these products... maybe it's just that people want to get eyeballs on their sites. We've been around for 34 years... haven't we earned the credibility and the trust of the press? 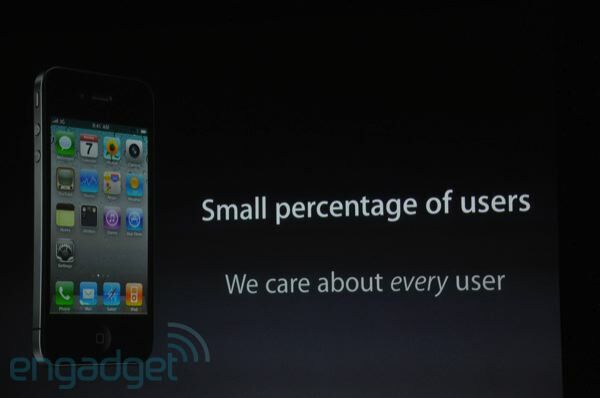 I think we have that from our users. I didn't see it exhibited by some of the press as this was blown so far out of proportion. I'm not saying we didn't make a mistake -- we didn't know that it would have these issues, we didn't know we were putting a bull's eye on the phone... but this has been so overblown. But to see how we could do better is going to take some time. 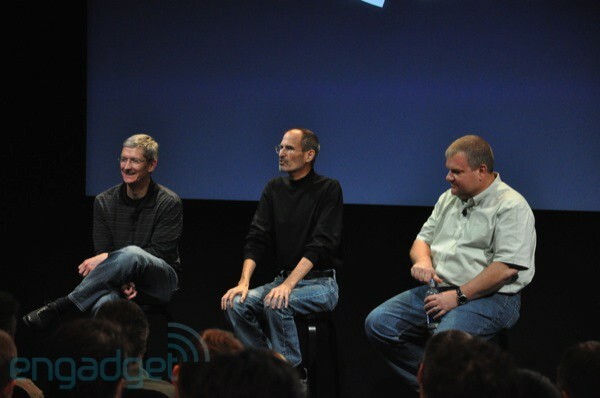 10:58AM John Gruber: Do any of you use the cases? I don't. Steve: Well I don't. 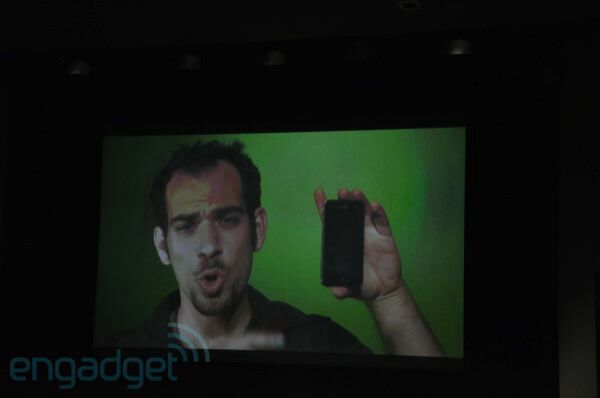 And I get better reception, I hold it like this [death grip] and never see problems. Q: Well it's interesting, there aren't any cases out there, and it's hard to get cases now. If the third party case buyers can produce a receipt, why not give them one? 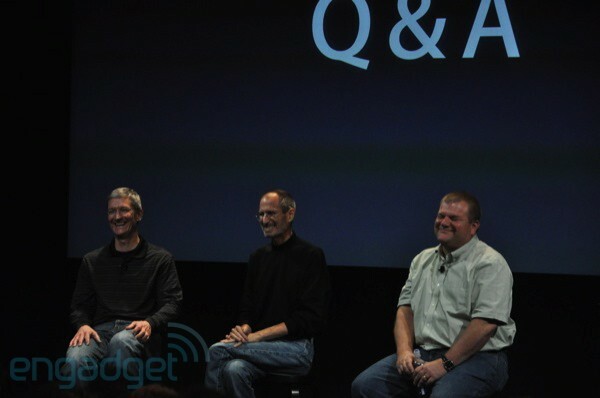 Steve: It's really simple, if we tell people what our next product is, they stop buying our current products. Sometimes websites buy stolen property and they get out there... and case makers have a history of showing off their new cases for our new products. The case vendors haven't had a history of helping to keep our work under wraps. 10:53AM Q: On the September 30th date, is that to let people know that you'll have to buy a case? Steve: Not really, we'll reevaluate then. Maybe we'll have a better idea. Maybe Eminem will come out with a band-aid that goes over the corner and everyone will want that. 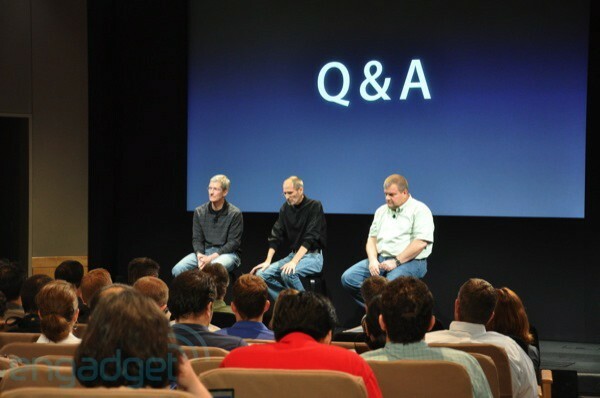 10:52AM Q: Is there anything you could have said in the launch keynote to lower expectations? Steve: (Long answer) Not really. We could have said "hey if you hold the phone in this certain way you might see some signal attenuation..." We're human. We make mistakes, and we figure it out fast. That's why we have the best and most loyal customers in the world. 10:48AM Q: Will there be refunds for AT&T contracts? 10:48AM Q: Do you think you're making users choose between form and function? Steve: No, we strive to do both. For instance, we make the phone smaller, so it fits well in your pocket... the Retina Display... it's like a fine printed book, it blows away other displays. It costs a little more, but we made it work. 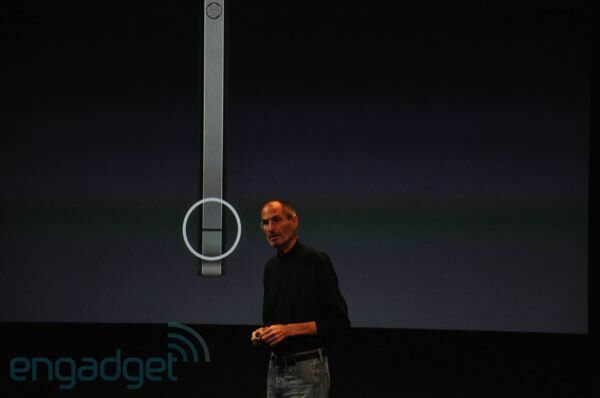 The iPhone 4 is an exterior antenna, so it doesn't live inside the case, we have a larger battery for better battery life. We try to have our cake and eat it too, we try to have great design and great performance. 10:46AM Q: Are you willing to make an apology to investors? 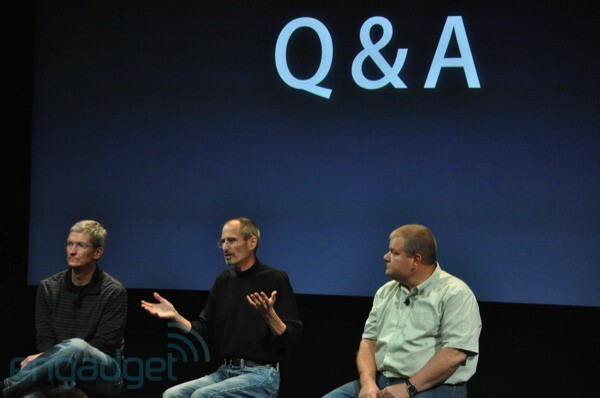 Steve: You know we hear from customers who love this phone and have a great experience with it, and we're doing a lot to help them with any issues they're seeing. To investors, you know, you invest in the company we are, so if the stock goes down $5... I don't think I owe them an apology. 10:44AM Q: Were you told about the design before the phone was released? 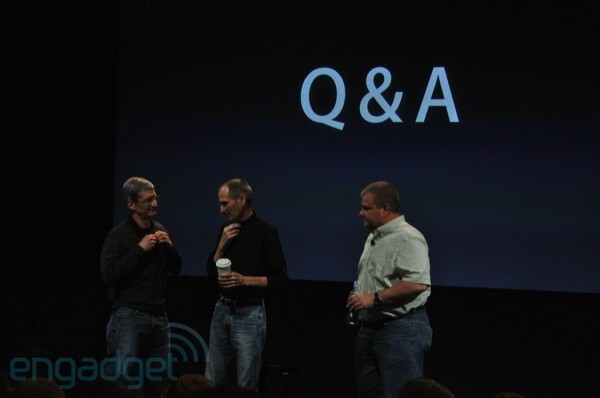 Steve: Are you talking about the Bloomberg article? That's a crock, and we've challenged them to show proof that that. If anyone had said this thing has problems, we would have dispatched people to deal with that issue. 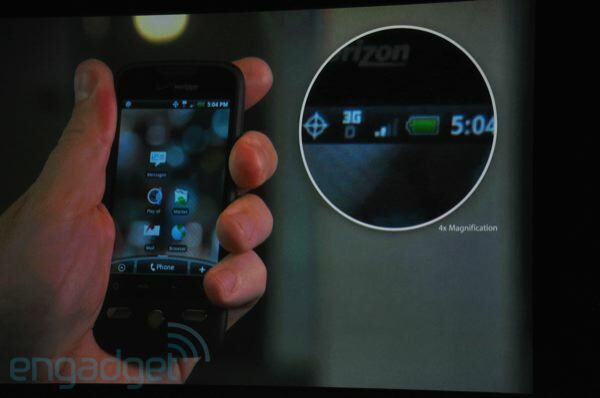 10:43AM Ryan from gdgt: You showed people almost covering the entire phone in their hand, but on the iPhone 4 it can happen with just a touch. Can you explain that difference? Hmm, that didn't really sound like an answer to us. 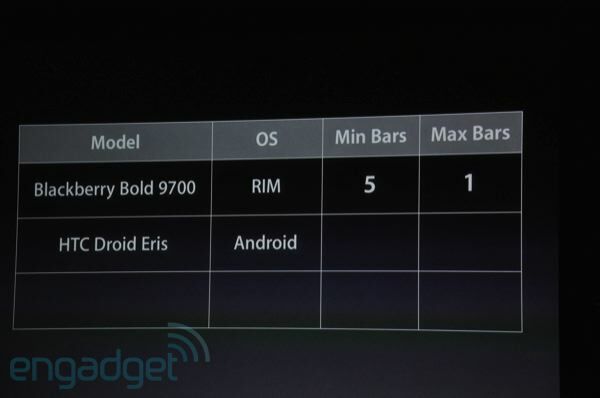 10:41AM Q: I can't get my Bold to drop right now, maybe you can show me how to do it? Steve: You may not see it in certain areas. 10:40AM Q: Are you doing anything else to address the issue? Perhaps changing hardware? 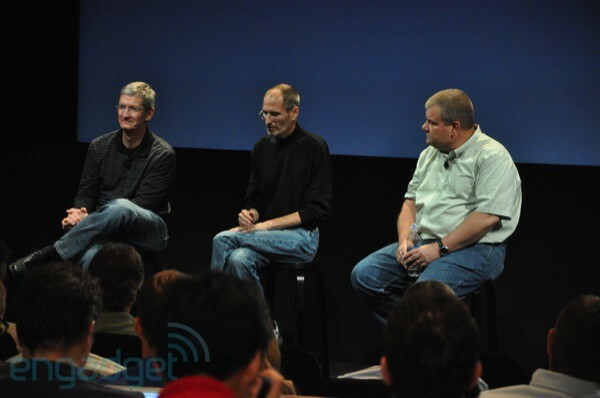 Steve: You know, the 3GS has the same problem. 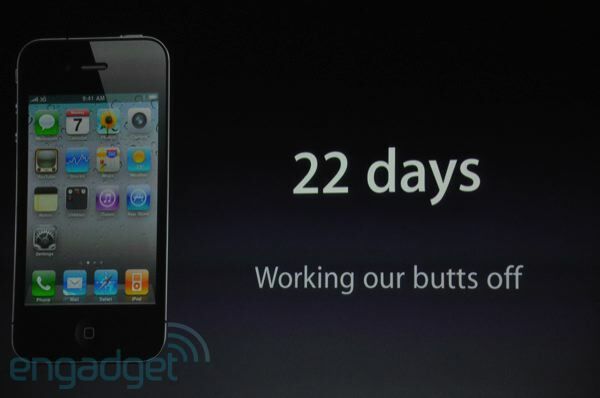 We're getting reports from customers that this is better than the 3GS. So I don't know changing the antenna design would help -- I don't know what our next antenna design will look like. 10:39AM Steve: I'm doing fine, I was doing better earlier in the week when I was on vacation in Hawaii. 10:38AM Uh, what? "Steve, how's your health? How are you doing?" Who let this person in here? 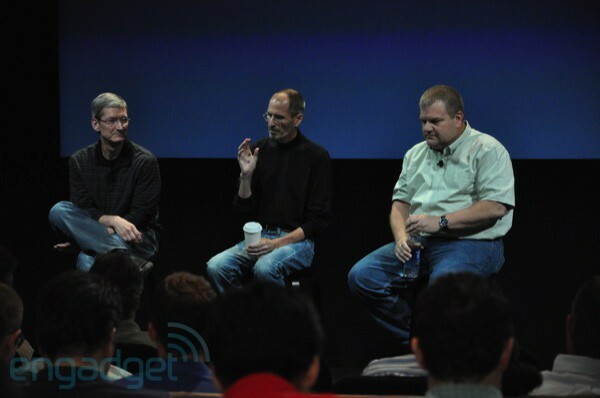 10:38AM "So that's what I wanted to tell you today, and now Tim Cook and Bob Mansfield are going to join me on stage to answer some questions." 10:37AM "So the heart of the problem is, smartphones have issues, and we made it easy to exploit the issue by showing people where to hold the phone to cover the antenna. 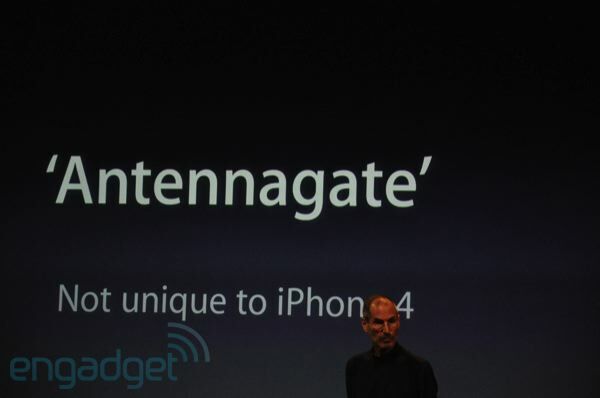 But the data supports the fact that the iPhone 4 is the best smartphone in the world, and there is no Antennagate... there is a challenge for the entire smartphone industry to improve its antenna technology so there are no weak spots. So today we're going to try and take care of our customers." 10:36AM "We do this because we love our users, and if we screw up, we pick ourselves up and we try harder. 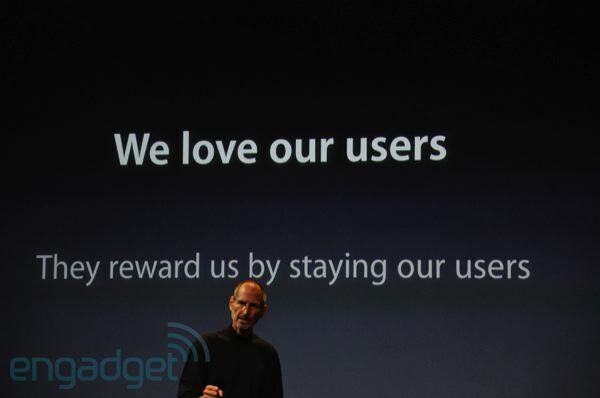 And when we succeed, they reward us by staying our users. We take this really personally. Maybe we should have a wall of PR people keeping us away from this stuff, but we don't, we take it really personally. So we've worked the last 22 days on this trying to solve the problem. And we think we've gotten to the heart of the problem." 10:35AM "In ending, I'd like to talk about how we make decisions. 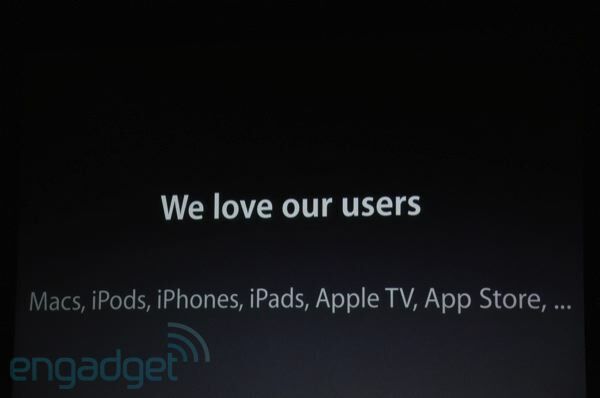 We love our users, we love them. We try to surprise and delight them... and we work our asses off. We have a lot of products that are pretty great for them, Macs, iPhones, iPods, iPads... So we love our users. 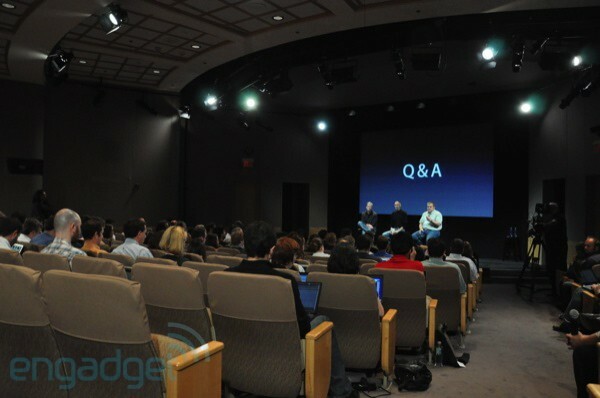 We also connect users with great apps and developers, and great content through iTunes, and really bring content creation and our users together. 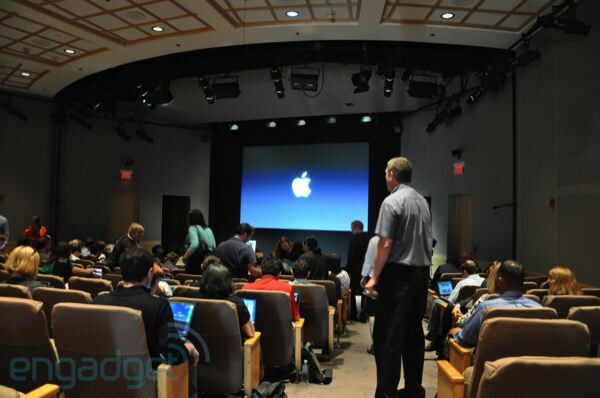 We love our users so much that we built 300 Apple retails stores for them to give them the best buying experience in the world... with Genius bars, and seminars. We had 60m people through our doors last quarter." 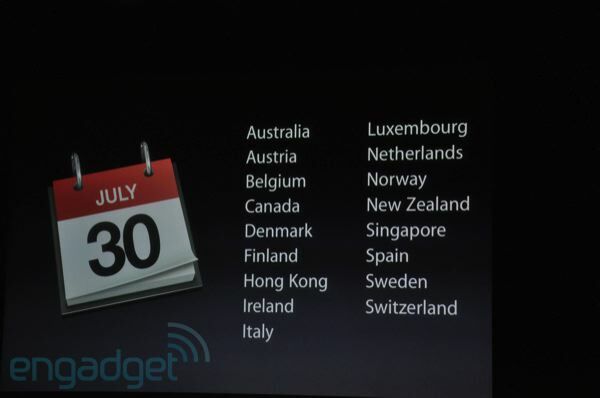 10:33AM "Also on July 30th, we're going to bring the iPhone to 17 more countries, with the omission of South Korea. 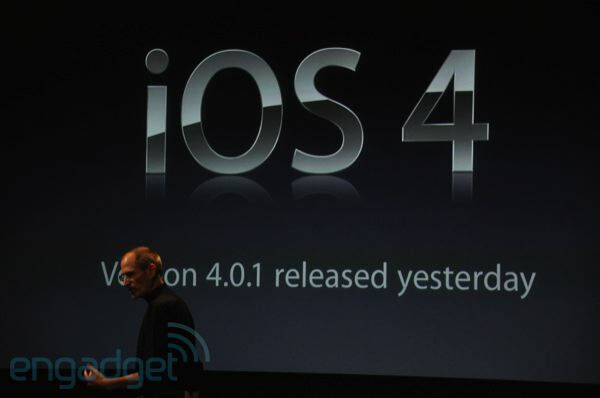 So that's the update on iPhone 4." 10:32AM "So I have some other updates. We're tracking some problems with the proximity sensor and we're working on it. 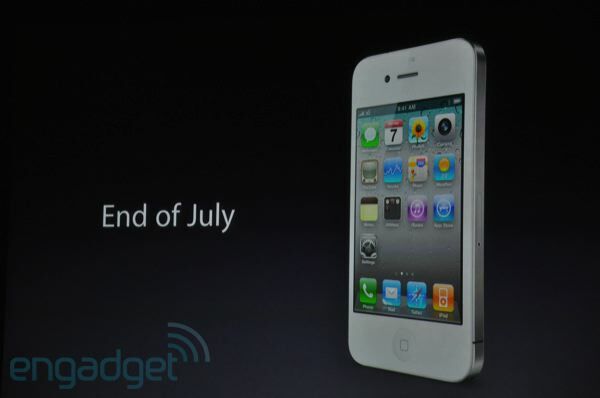 White iPhone, we're going to start shipping at the end of the month." 10:31AM "And if you're not happy, you can bring the phone back. We'll give you a full refund within 30 days. No restocking fee. We want to make everyone happy, and if we can't make you happy we'll give you a full refund." 10:30AM "We're going to send you a free case. We can't make enough bumpers. No way we can make enough in the quarter. 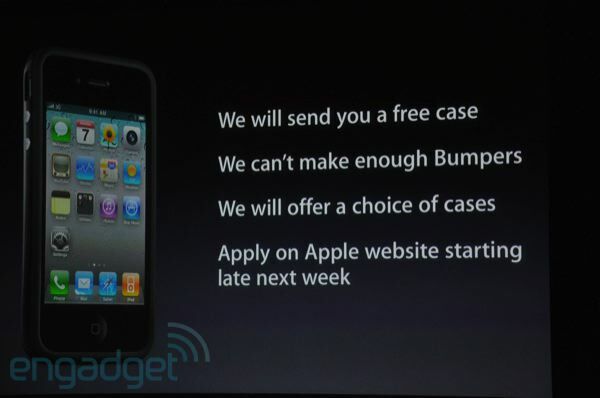 So we're going to source some cases and give you a choice." 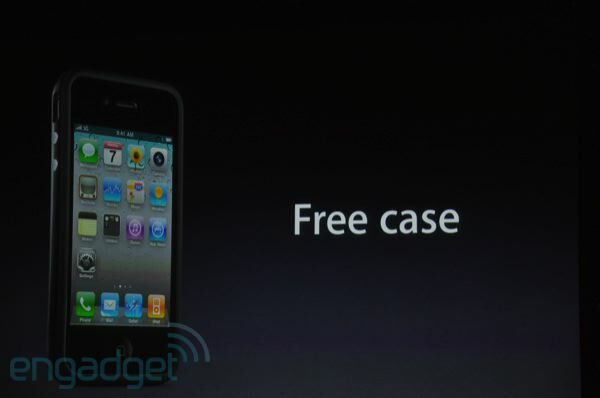 10:30AM "A free case for every iPhone 4 buyer. If you got one, we'll give you a refund." 10:29AM "We think this has been so blown out of proportion... it's fun to have a story, but it's not fun on the other side. So here's what we're going to do to make our users happy. 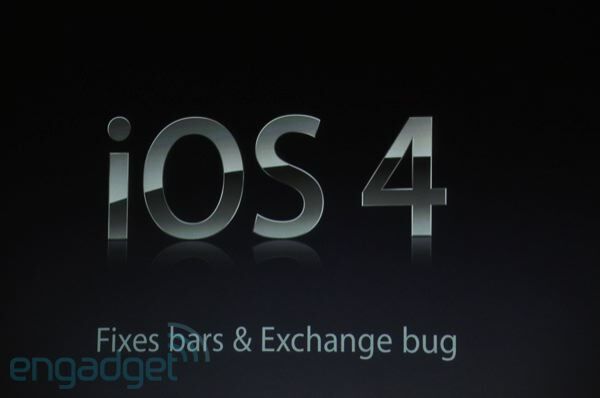 The first part is the software update, that fixes the way the bars report and other bugs, that's out now. Second, people said the bumper fixes everything... 'why don't you give everybody a case'? Okay -- we'll give you a free case." 10:28AM "Now when we look at this data, it's hard to escape the conclusion that there is a problem, but that problem is affecting a very small number of users. I get emails saying the phone works perfectly, and they can't understand what this is all about. So we think it's affecting a small batch, but it has to do with inherent problems in smartphones. 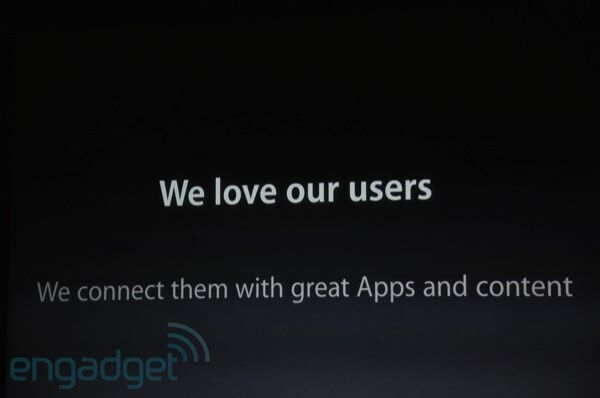 But we want all of our users to be happy." 10:27AM Now Steve is going down the list of these factors. 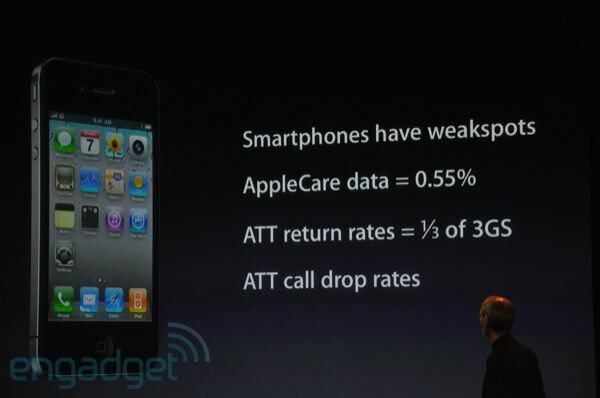 Smartphones have weakspots, AppleCare has not been slammed with complaints, return rates are super low, and it only drops "less than 1" call per 100 more than the 3GS. 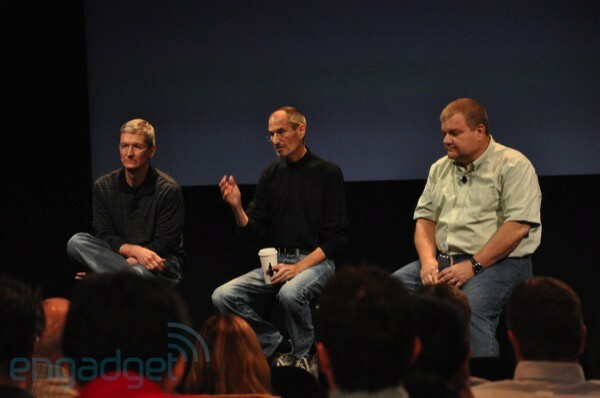 10:26AM "When the 3GS came out, we didn't change the design from the 3G. So there were already lots of cases out there for the phone. And more than 80% of new buyers left the store with a case. Now the new phone doesn't fit those cases, and we can't make these bumpers fast enough, so only 20% leave the store with a case... but we're going to figure it out." 10:25AM "Now, even less than one is too much for us. We want to find out why. But this does put it in perspective. So I have my own pet theory. We have no proof of it, but I'm going to give it to you." 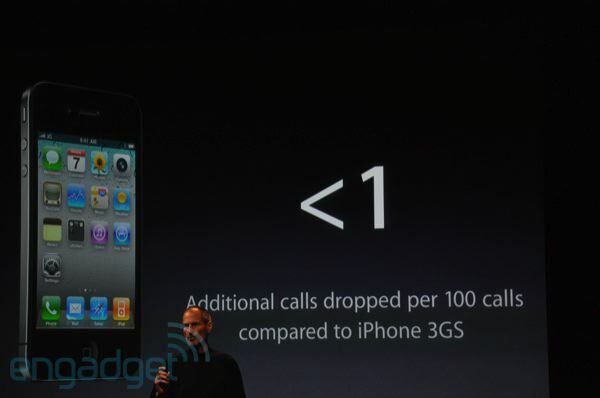 10:25AM "This is hard data... the iPhone 4 drops less than one additional call per 100 than the 3GS. Less than one." 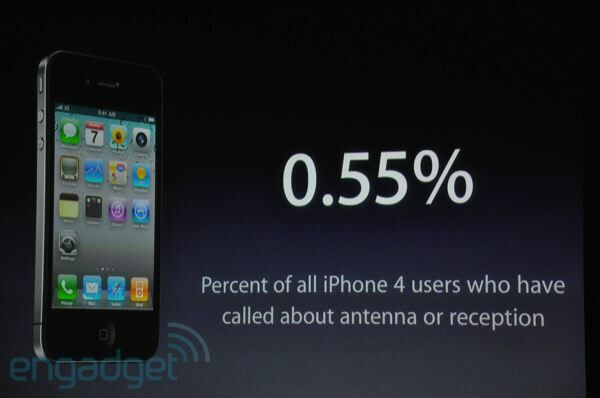 10:24AM "Even though we think the iPhone 4 is superior to the 3GS antenna... it drops more calls per 100 than the 3GS. We're being transparent. 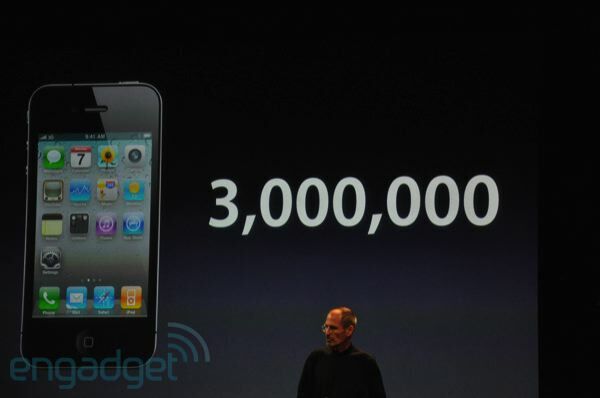 So how many more does it drop than the 3GS?" 10:23AM "Pretty interesting... one more data point. AT&T has given us the early call drop information just a few days ago. They log call drops, it helps them improve their network. So we can't give out the absolute call drop data... AT&T can't release those numbers to their competitors, but we're going to give you the delta." 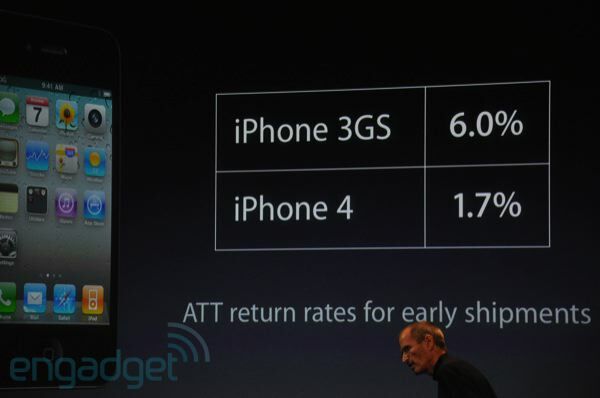 10:22AM "In the early days of the iPhone 3GS return rates were 6%... below the average, we were happy with that... so for the iPhone 4? You think half the people must be returning their phones with what you read online... well it's 1.7% -- less than a third of the 3GS returns." 10:21AM "This is not a large number. This doesn't jibe with what you read. Let's keep going. 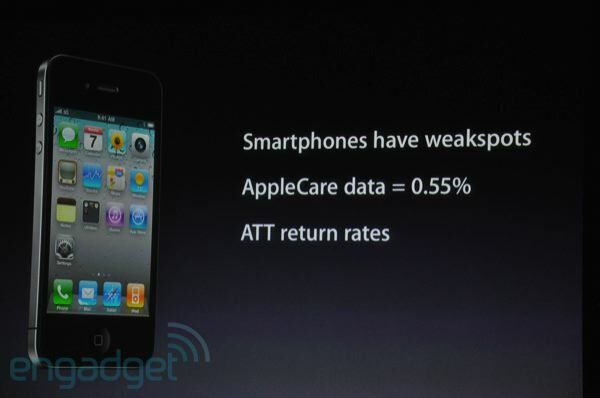 So smartphones have weaknesses, and AppleCare data shows only 0.55% have called in about reception issues. 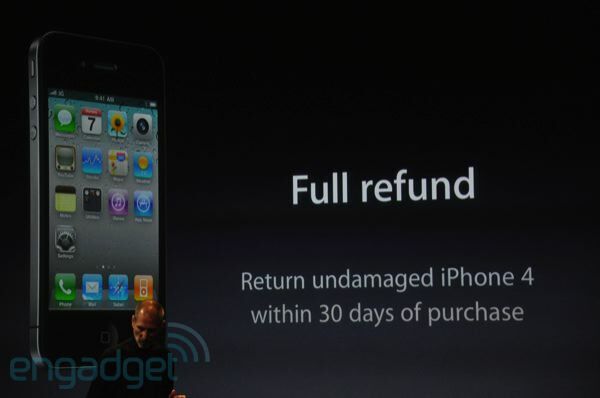 The third, return rates... AT&T has a 'buyer's remorse' clause, you can return a phone no questions asked. 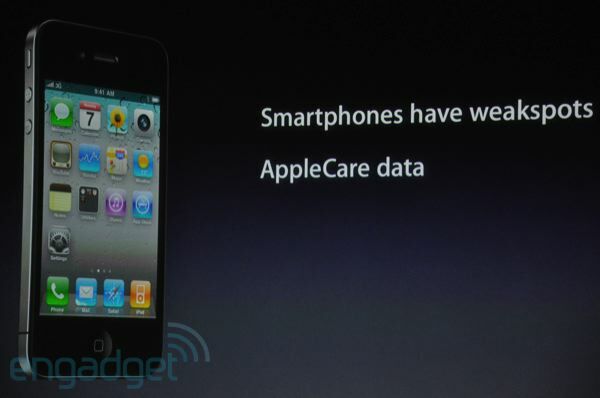 Apple has the same thing. So what are our return rates? 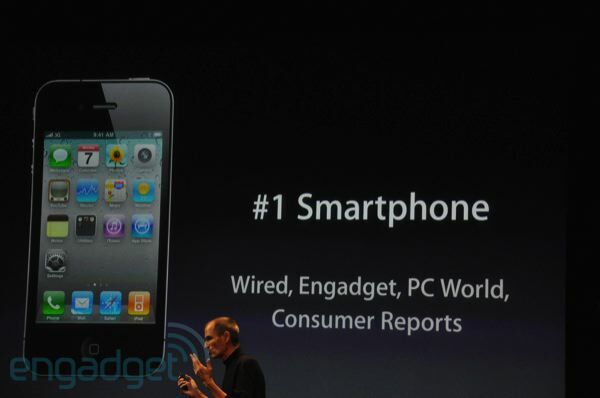 Well we're going to compare it to the iPhone 3GS..."
10:19AM "So what have we learned? 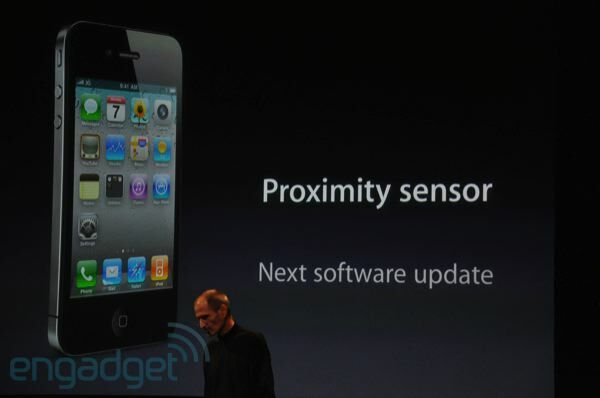 Smartphones have weak spots -- this isn't just the iPhone 4, it's all phones. 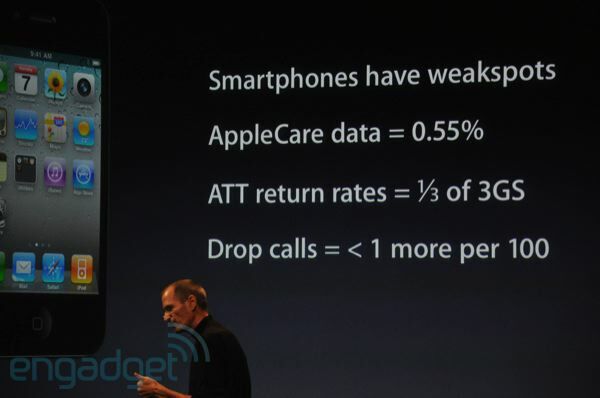 Next, some really interesting data from AppleCare, we looked at the statistics, we asked what's the percentage of all iPhone 4 users that have called AppleCare about the antenna or reception, or anything near reception problems. Because you would have thought 'Jesus, it must be a lot of users complaining about this' -- So what percentage have called AppleCare? 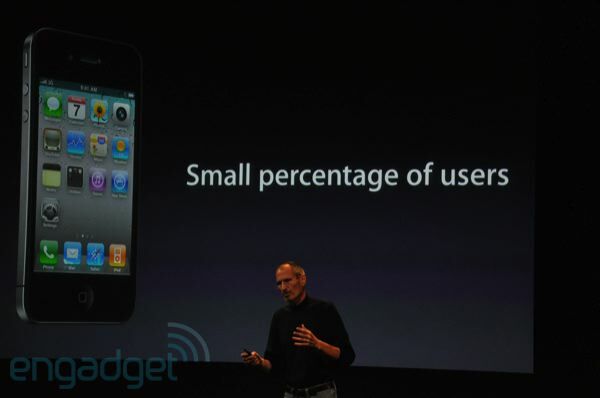 0.55% Just one half of one percent." 10:18AM "We knew that you could see bars drop on the phone when you hold it in a certain way, it's a fact, phones aren't perfect. 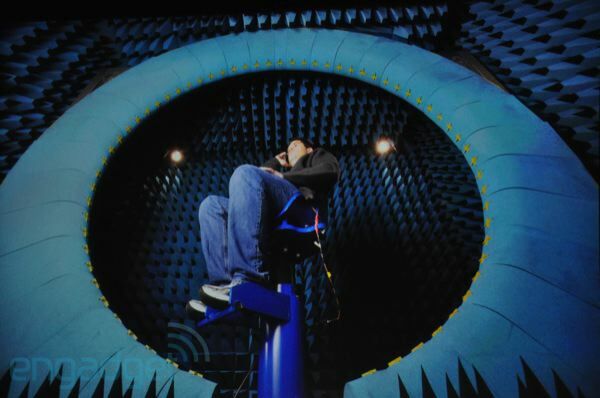 But people are reporting better reception with this antenna than they've ever seen before." 10:17AM "You have to build these rooms or you don't get accurate results. This is a state of the art facility. We've invested over $100 million on this. 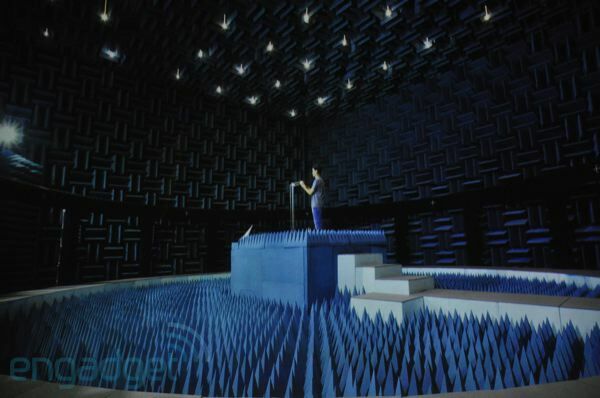 We have 17 anechoic chambers." 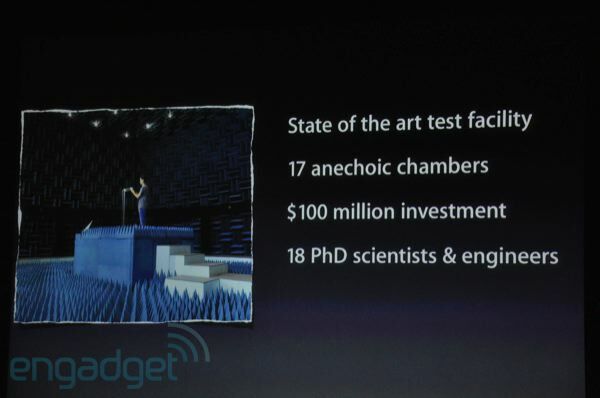 10:16AM "Now we do a lot of testing, this is an actual device we test in. And here's our biggest room right here." 10:16AM "And we had a reporting error -- we screwed up on our algorithm. Some of these other phones may be too generous. Our choice was to put the correct algorithm in. And we did that with the new update. You'll still see a drop... we haven't figured out a way around the laws of physics yet." 10:15AM "Now we're not perfect. We made it very visible with a little help from our friends on websites. We put this little line here... 'here's where you touch it everybody!'" 10:14AM "So we could have gone on and on. Most smartphones take a hit exactly the same way. 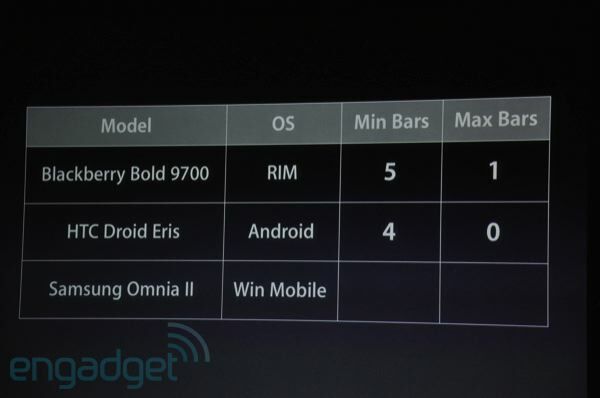 These were all tested in areas of relatively weak signal strength. This is life in the smartphone world. 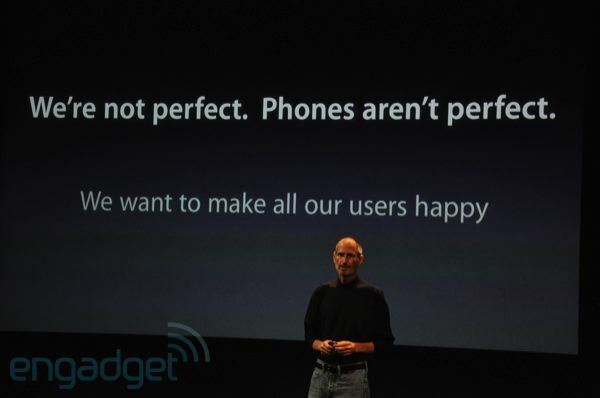 Phones aren't perfect. It's a challenge for the whole industry. Every phone has weak spots." 10:13AM "None of this is standardized... and so again, you'll see it go back up. They go back up faster than they go down." 10:12AM "Starts off with 4 bars... and the time it takes for the bars to go down has to do with the algorithm... so it goes down to zero bars, and then it goes back up." Definitely looks like the same behavior. 10:11AM "There's the Bold, 5 bars to 1 bar." "Next, the Droid Eris." 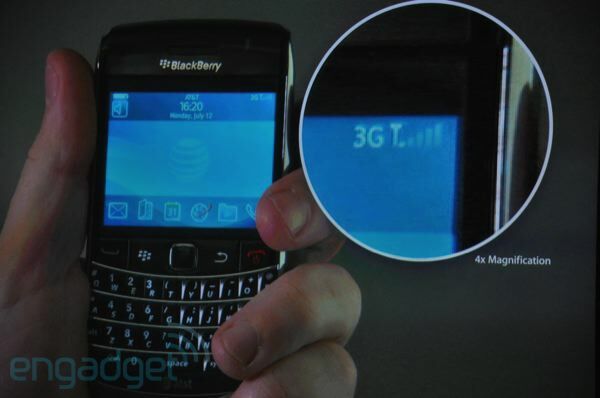 10:11AM "The BlackBerry Bold 9700... let's see what happens when you hold it in a normal way... 5 bars... and now on holding the left side. The bars go down." 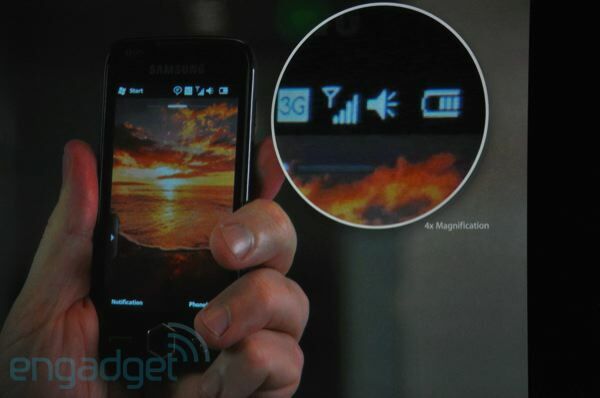 10:10AM "Antennagate -- that doesn't seem like a good thing if you can make the bars go down by touching the phone. 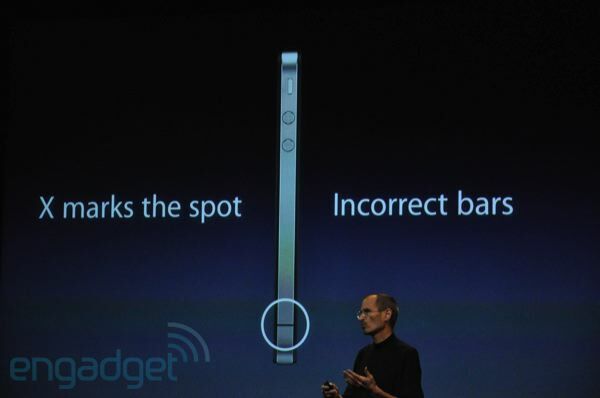 Well we first learned that this doesn't just happen to the iPhone, Nokia, Motorola... other phones have this issue. But we didn't trust the videos on YouTube, we started doing our own testing... here's what we discovered." 10:09AM "This was 22 days ago... we haven't had out head in the sand. We've been working on this for just 22 days. We are an engineering company, and we want to find out what the real problem is. We've been working our butts off so we can come up with real solutions. And we want to share what we've learned." 10:09AM "We started getting reports about issues with the antenna system, and, the problems they were saying... Gizmodo put their video on the web, touching the corner, and people were seeing a large drop in bars." 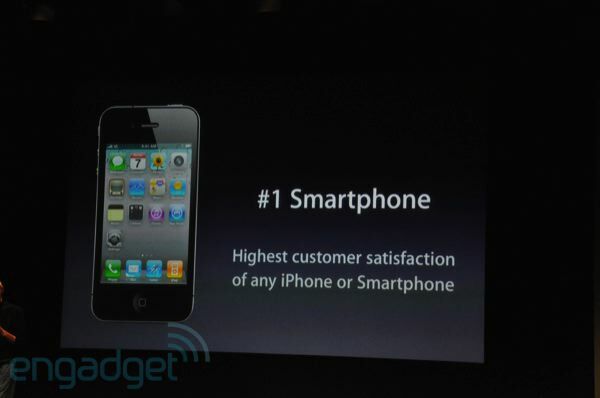 10:08AM "It has the highest customer satisfaction rating of any iPhone and any smartphone out there." 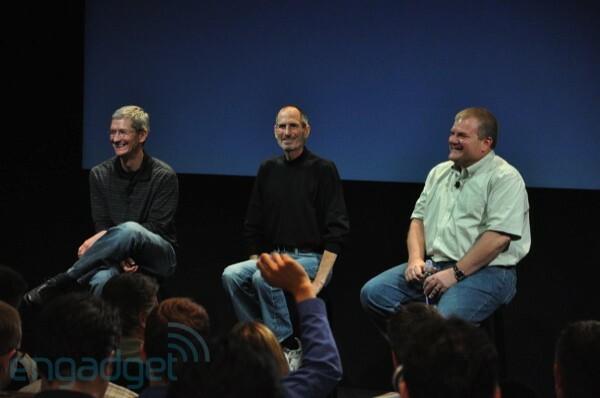 10:08AM "The iPhone 4 is perhaps the best product we've ever made at Apple. We've sold well over 3 million since we launched it 3 weeks ago. 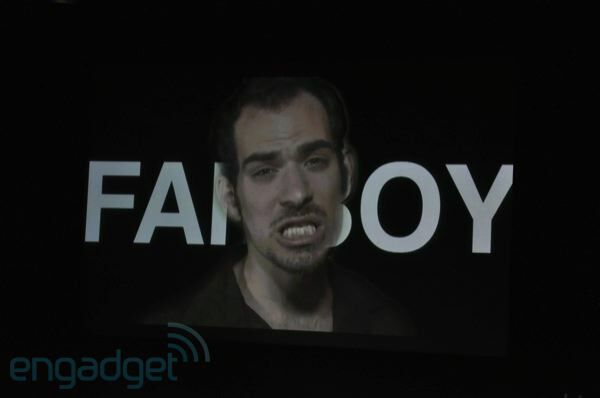 It's been judged the number 1 smartphone..." Hey, Engadget! 10:07AM "We're going to talk about how we're going to do that, but first I want to talk about some data." 10:07AM "But we want to make all of our users happy. If you don't know that about Apple, you don't know Apple. 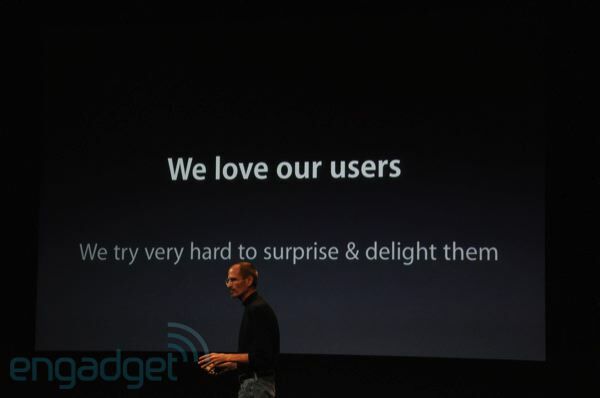 We love making our users happy." 10:07AM "You know, we're not perfect. We know that, you know that. 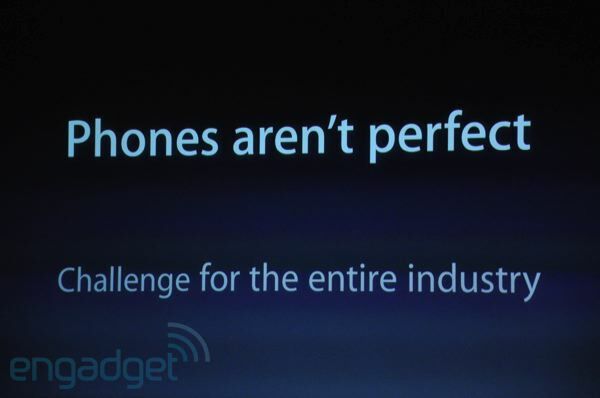 And phones aren't perfect either." 10:06AM "Good morning, we saw that on YouTube and wanted to share it. We're going to answer your questions, but I have a 15 min presentation first." 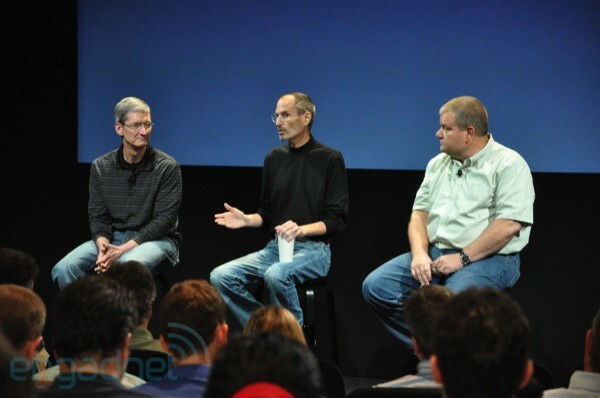 10:06AM "Bring it back to the Apple store... but you know you won't." And Steve is out! 10:05AM "Hey let's all sing this song: if you don't want an iPhone 4 don't buy it, if you bought one and you don't like it, bring it back." 10:05AM "Oh sure I can make it happen, but in terms of daily uasage... 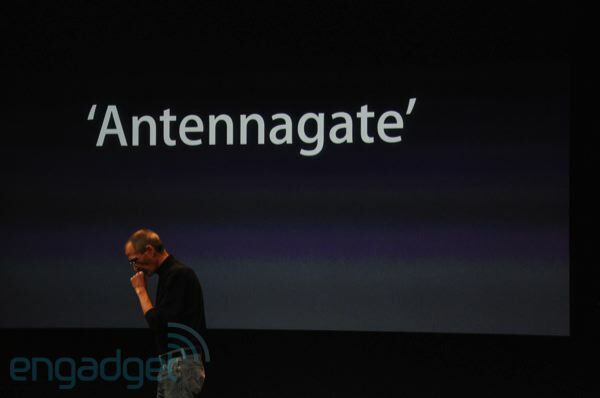 I have yet to drop a call..."
10:04AM "There's an awful lot of hoopla... about the iPhone antenna..." Wow. 10:04AM Oh my. "The iPhone 4 antenna song" just came on! 9:59AM Hey guys -- comments should be on now. Also, we're not going to force you, but if you want to hit that Digg badge and vote us up, we'll love you forever and ever. 9:57AM Okay we're in our seats... and some smooth, smooth jazz is playing. The room is not completely full -- not surprising given the short notice. 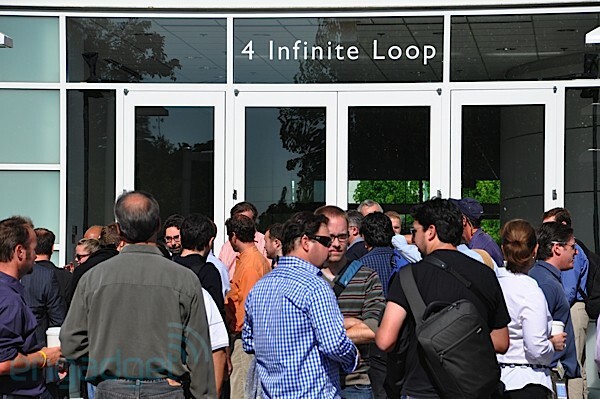 9:32AM We're on the ground at One Infinite Loop and waiting in the extremely bright sunlight to get inside. For one day of notice, there are a surprising amount of people here.